One of Los Angeles punk rock’s most widely admired yet little-heard bands makes a striking return to records on Jan. 18, as Yep Roc Records issues an all-new collection by The Flesh Eaters, I Used to Be Pretty. 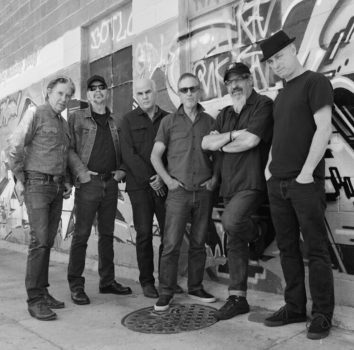 On the release, founding vocalist and songwriter Chris Desjardins — better known as Chris D. — is backed by the legendary “all-star” edition of the band, originally heard on the 1981 set A Minute to Pray, A Second to Die: Dave Alvin (guitar) and Bill Bateman (drums) of the Blasters; John Doe (bass) and D.J. Bonebrake (marimba and percussion) of X; and Steve Berlin (saxophones) of the Plugz (and later the Blasters and Los Lobos). The album was produced collectively by the band members. The band’s first records employed various ad hoc assemblies of local punk musicians. For its second album, the howling, swampy, hoodoo-infused A Minute to Pray, A Second to Die — produced by Chris D. and released on Slash’s subsidiary imprint Ruby Records — the singer recruited a band then unrivaled for musical firepower. The potent lineup played only a handful of unforgettable local shows before its members’ commitments to their own bands sundered the group. However, the Minute to Pray Flesh Eaters’ reputation abided for decades, and in 2006 the lineup reunited for an appearance at the All Tomorrow’s Parties festival in the U.K. and a few West Coast appearances. Two more brief regroupings followed in 2015 and 2018. “Ghost Cave Lament,” the sprawling 13-minute song that closes the album, was developed by Desjardins and Alvin before the recording sessions. This incantatory epic’s musical setting was inspired by “Moritas Moras,” an extended piece by flamenco guitarist Manitas de Plata.